Mian geda soup is a very popular dish in China. Similar to Gnocchi, mian geda (means dumpling knots in Mandarin) is made from very soft flour dough and dropped in various delicious soups. In a blazing cold winter day, a bowl of mian geda will warm you up from head to toe. This past Saturday was quite cold. After our grocery shopping in the morning we arrived in home already noon, so I made this quick soup with some pan-fried potstickers for lunch. What a treat! 6) 1 tsp sesame oil, 1 tsp freshly chopped green onion. 1: Rinse the tomato and cut into slices. 2: Heat 1 tbsp olive oil in a medium sauce pot over high heat. Sauté 1.5 tbsp freshly chopped green onion (Picture 1) for a minute. Add sliced tomato (Picture 2) and sauté for 1-2 minutes. Add the rest ingredients of Ingredient 2). Reduce to medium heat and bring to a boil. 3: In the meantime, prepare the dough: measure all ingredients in Ingredient 3) in a medium bowl. Stir using a pair of chopsticks in one direction for 5 minutes (Picture 4), until the dough is elastic and very sticky (Picture 5). 4: When the tomato soup starts to bubble, tip the bowl to bring the dough toward the edge. 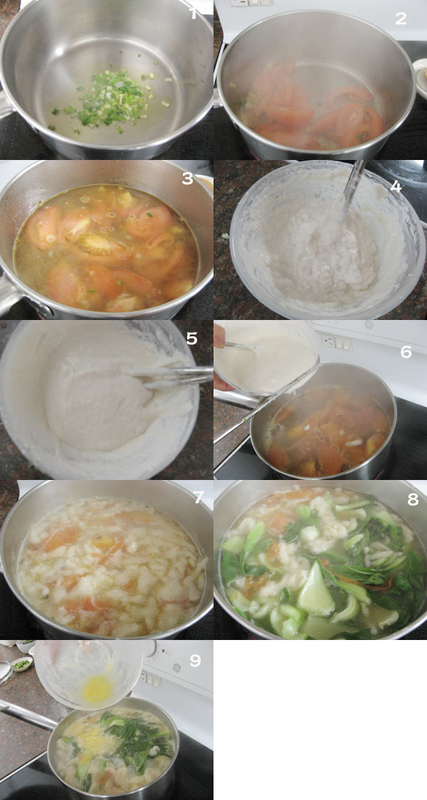 Use a chopstick to grab a small piece of dough and drop it into the soup in a slicing motion (Picture 6). Repeat to finish all the dough (Picture 7). 5: Add baby bok choy (Picture 8) and cook for 2 more minutes. Pour in the beaten egg in a slow stream (Picture 9) and stir as you pour. Turn off heat. Add all ingredients of Ingredient 6), and mix well before serving. This entry was posted in Main dish, 汤 and tagged Breakfast Lunch Dinner, Chopstick, Chopsticks, Cold Winter Day, Cook Time, Delicious Soups, Flour Dough, Flour Mixture, Geda, Green Onion, Green Vegetable, Grocery Shopping, Ground White Pepper, Lunch Dinner, Medium Bowl, Mian, Pan Fried, Pepper Powder, Potstickers, Purpose Flour, Sauce Pot, Sesame Oil, Slow Stream, Tomato Soup, Tsp, White Pepper. Bookmark the permalink.